Keep warm and cosy in our made to order Onesies. Our made to order onesies are right on trend and are ideal for dancers and gymnasts to wear to and from competitions and in the chilly halls between performances. Swimmers can slip them on to keep warm during those early morning training sessions and with logos and names embroidered or printed, your team, swimmers or dancers will no longer be turning up in their own animal print onesies!! We now have a new sleeveless onesie available in cropped leg or full length, ideal for the summer. All onesies are available with or without hoods and pockets and you can choose to have your logo and names on the front, back, hood, sleeve or leg, in fact the choice is endless! A huge range of colour combinations is available so contact us now to see the full range. Prices start from just £25 but in order to quote we need to see artwork for any embroidery or printing. 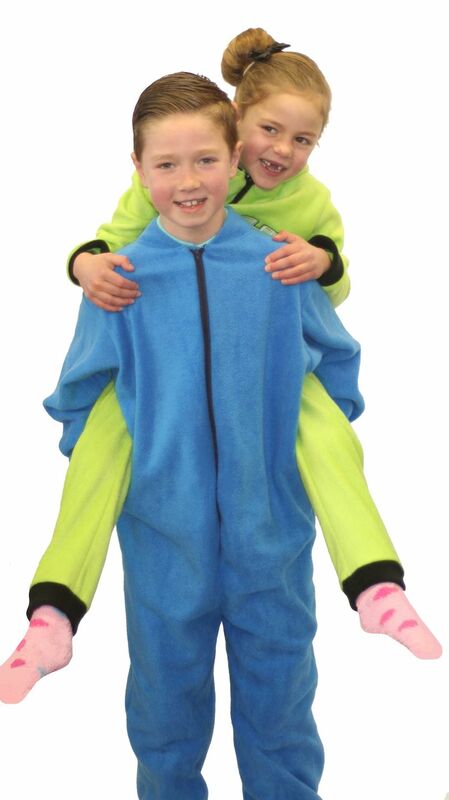 We manufacture the onesies in kids and adult sizes and we have no minimum order.